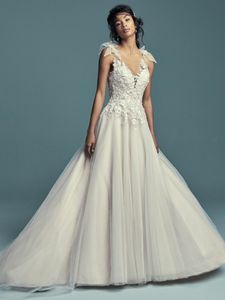 Description: Embroidered lace motifs accented in beading and Swarovski crystals dance over the bodice of this romantic A-line wedding dress, completing the illusion plunging V-neckline, illusion straps, and illusion back. Pretty bows accented in beading and lace motifs complete the straps. Layered skirt comprised of tulle and textured tulle. Finished with covered buttons over zipper closure.